International Walk & Bike to School Day is already drawing record participation for the 2017 event. The annual international campaign, Walk & Bike to School Day, is taking place on October 4th this year. Although the movement began as a short one day event back in 1997, the complete month of October is now dedicated to this as well as a Walk Week from October 5th to the 9th. Then, of course, there is the unofficial Walk for Candy Day on the 31st. Oh, wait, that’s Halloween! Why a “Walk & Bike to School” Day? 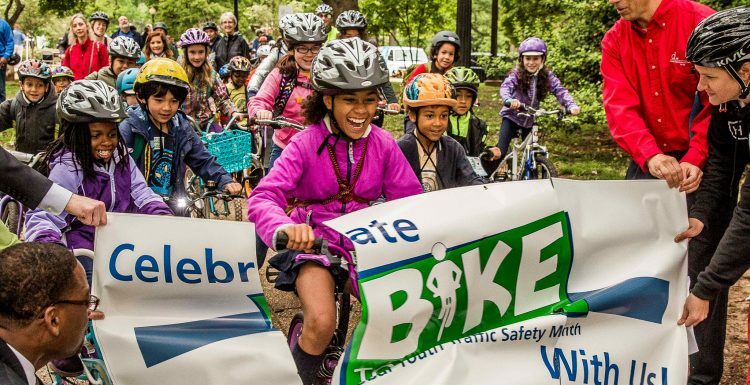 Over the years the campaign has grown in popularity and has played a serious part in the movement of supporting safer routes for children walking or biking to school. The Walk & Bike to School campaign also promotes both the health benefits of higher levels of mobility and the environmental benefits of reduced use of motor vehicle transportation. Entire communities are positively affected when their pedestrians are safer, their children are healthier, and their air is cleaner. A community that focuses more heavily on supporting walking and biking as an alternate or main means of transportation can lead to less traffic congestion. With less personal vehicles and buses navigating through school zones and surrounding streets, all motorists can expect a slightly less stressful local commute. Families that live in communities with higher rates of walking and bicycling can expect economic gains to home values as investments in pedestrian related infrastructure are made. Local businesses can also expect the same with the improved accessibility to those walking and biking. Not only can there be broad economic gains, but a family that actively participates in a more pedestrian oriented lifestyle can save money on gas and general car maintenance like oil changes, tire replacements, and more. Communities with higher rates of walking and bicycling are much more likely to invest in creating and maintaining safer routes including sidewalks, bike routes, and more pedestrian signs and signals at intersections and throughout roads. Instruct children to ALWAYS walk on sidewalks. If a sidewalk is not available on your child’s immediate route, consider finding an alternate route and contacting your city council about the matter. Instruct your children to always cross the street at marked crossings and when they do cross, to always look left to right and then left again. Have your children wear a reflective item. A backpack, hat, bracelet, shirt, shorts, pocket attachment, or other apparel should have reflective properties that allow children to be seen more easily by motorists. Talk to your city council members about changes in speed limit in high walking/biking areas and making sure curb ramps are at every intersection and mid-block crossings. While you can plan for your child to walk to school for the first time on your own, there are schools and organizations all over the globe that will be celebrating Walk & Bike to School Day this year in community lead events. International Walk & Bike to School Day continues to draw record participation and already has 3,000+ participants registered for 2017. For more information, connect with Walk & Bike to School Day through their official website and Facebook page. Will California Replace Gas Vehicles With Electric Cars?